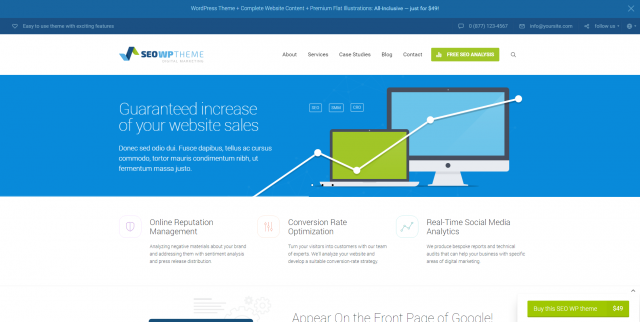 SEO WP is the best selling theme for online Marketing on Envato Themeforest.net marketplace. It is a flexible WordPress theme specially designed for Digital Marketing Agencies, SEO companies, Social Media specialists and their clients. Built with tons of features, SEO WP is an easily customizable, responsive and fast loading theme, purposely designed to give you the absolute control of your website. Packed with free images and plugins, this theme is the right choice for your online marketing business.